Severtson Screens (www.severtsonscreens.com), a global leader in innovative and quality projection screens for the cinema, commercial, pro AV, and home theater markets, has announced that it will feature its acclaimed Folded Silver 3D screens, SAT-4K ultra acoustic transparent screen, and new Giant QuickFold screens, as well as updated price estimator technologies during ShowEast 2018, held in Miami, Fla. from Oct. 22-25 at Lowes Miami Beach Hotel in Miami Beach, Fla., booth # 214. 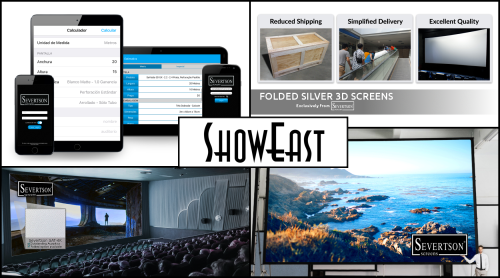 Digiperf screens utilize 7.5 percent open space, are available with all coating and gains, are foldable as with all Severtson cinema screens (excluding electric screens), and it reduces moire over traditional standard perf screens. Severtson’s new Giant QuickFold Screen Line includes dual frame construction for superior support and to prevent hour-glassing of the screen. Additional options include choice of multiple perforations, Silver 3D and Stellar White gains, and dress kits. The screens break down into a custom-built case depending on the size of the screen, thus making them incredibly portable. Severtson’s revolutionary coating allows the screens to be folded both for shipping and then for regular use. It’s the perfect answer for what was once an impossible scenario for a large format cinematic 3D screen. Severtson also recently announced that it has enhanced its cinema screen price estimator for its dealer base with Spanish and Portuguese language options. The price estimator is available via the Severtson website as well as a mobile app for Apple iOS and Android Smartphones.